Click the gear icon in the upper right, then select “Settings”. In the General tab, select the check box next to “Enable input tools” under the “Language” section. In the “Input Tools” setting dialogue that appears, select the input tool you’d like from the “All input tools” field and click the grey arrow so that it appears in the “Selected input tools” field. Once you’ve enabled Input Tools, you will see an input tools icon on the left of the gear icon, e.g. Truecaller is a global phonebook service which brings all the contact information of the world into your smartphone and online. In addition to its worldwide number lookup service, Truecaller can help you block unwanted calls, keep your phonebook up to date with current information and even map your phonebook with the social networks you use regularly. 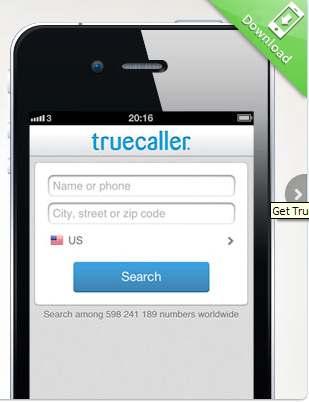 Truecaller was developed by True Software Scandinavia AB, a privately held company in Stockholm, Sweden founded by Alan Mamedi and Nami Zarringhalam in 2009. Visit this site and enter the phone number,ensure that you select correct country in drop down.after entering the detail you will asked to login using YAHOO/GOOGLE/FACEBOOK account just login and get the search result. Here I would like to add to Indian user that for INDIAN phone number this might not work correct for all phone number. for Indian phone number because database is all based on crowd-data that means if some one has sync his /her phone number with truecaller then it possible that your number can be searchable.so finally you can't relay fully on this search result.Suppose someone using this application and he has allowed to sync the phone book with database of True caller then all his phone book will get added to True caller database. Since in India there is no Public mobile phone directory so relevancy of the search number may not be always correct. Some time if someone has added some nick name or wrong name with his friend phone number in his mobile phone book then same it will be get added to true caller database after sync and it will be visible as nick name while searching. It is supported everywhere in the world. Please remember to add your country code, for instance +46707420478. Note: This does not affect results presented by partnering whitepages directories. And it may take up to 48 hours before it's removed from their database.